Eagle Wind Flutes are handcrafted, traditional, Native American Flutes by Jonathan Maracle, a Mohawk from Tyendinaga Territory in Ontario Canada. Jonathan is a well known musician, songwriter, recording artists, and founder of Broken Walls, an internationally recognized Native American band. Jonathan began making Eagle Wind Flutes years ago to play on tour and in the recording studio. They quickly became popular and the need arose to make them available for sale. He and his family hand craft each flute with traditional Native American values and techniques to make an unmistakable sound and feel. To this day these fine Native American Flutes are crafted in Jonathan’s family work shop on his property in Ontario using the wood and materials that his forefathers made flutes from for centuries before him. 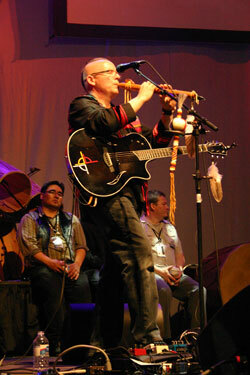 Today the traditional Native American Flute sounds from Eagle Wind Flutes are heard around the world on recordings like “The Fathers Dance”, “Healing Winds”,”The Clearing”, and “Christmas on Turtle Island” which won the Instrumental Album of the Year and Flute Album of the Year at the Aboriginal Peoples Choice Music Awards. At Eaglewind Flutes I generally like to use softer woods, I find they deliver warmer tones to the ear of listener. I have found different types of Cedar that are plentiful on our Mohawk land and the surrounding area. We have made flutes from Swamp Cedar, Red Cedar, White Cedar and many other types of wood. I design each Eaglewind flute for maximum playing comfort. The mouth piece is worked and shaped for maximum comfort for the player. The finger holes are contoured for the least resistance and ease of play. As a flute player who has had multiple nominations, won several national awards on Eaglewind Flutes, I have had the opportunity to refine my flutes into what works best for me. Each flute gets personal attention to the details that make it an Eaglewind Flute. What I call the block, a separate piece usually located on the top of the flute, closer to the mouthpiece can also often be a signature of the craftsman who makes the flute. I have chosen to make my blocks with a low and flowing contour in order to compliment the look of the flute as a whole. I also make my blocks with walls around the sound hole so that if you play in the wind, it will not steal your tune so easily. Sometimes I will laminate a couple different woods together to build a block and then put a matching piece of wood on the other end of the flute to compliment it. Often, wood we use will have long flowing grains that we sand in a particular way to show the beauty of the grain and then complete the flutes aesthetic appearance by doing a beautiful freehand wood burning design. There are never any two flutes that are the same, each one has its own personality and tone. At Eaglewind we view the flute as not only a musical instrument but also as a work of art. It is created, crafted and finished, to find and release the natural beauty of the wood itself without using any stain or colouring. This means we choose the type of wood, its colour, its texture, the knots, the flow of the grain in order to find the tone and final personality of the particular instrument. As an example, Juniper, has lots of small knots that render a flute that needs careful cutting and little decoration because of its natural beauty. Each flute is hand burned with the Eaglewind logo, its number, the year it was created, the initials of the creator and the key of the flute.